Fiat to Peugeot | What Car? Check out Mammothcars.com for a 563 saving on the Fiat 500 1.2 Pop Start-stop. Price you pay: 9337. Go to Autobytel.co.uk for a 2750 saving on the Ford Fiesta 1.25i 82 Edge 5dr. Price you pay: 9295. Pay 2783 less than list price on the Ford Focus 1.6 125 Zetec 5dr with Dealdrivers.co.uk. Price you pay: 14,717. Get a 2361 saving on the Ford Grand C-Max 1.6 125 Zetec with Drivethedeal.com. Price you pay: 16,934. Save 2853 on the Ford Mondeo 2.0 TDCi 140 Zetec with Carfile.net. Price you pay: 19,292. Coast2coastcars.co.uk will save you 3347 on the Honda CR-V 2.2 i-DTEC EX. Price you pay: 26,118. Go to Drivethedeal.com for a 4738 saving on the Hyundai i30 1.4 Comfort ISG 5dr. Price you pay: 9747. Go to Coast2coastcars.co.uk for a 3681 saving on the Hyundai Santa Fe 2.2 CRDi Style five-seat auto. Price you pay: 20,664. Pay 3063 less than list price on the Jaguar XF 2.2D SE with Drivethedeal.com. Price you pay: 27,887. Drivethedeal.com will save you 8207 on the Jaguar XJ 3.0D Portfolio. Price you pay: 58,408. Mkkia.co.uk will save you 3500 on the Kia Sorento 2.2 CRDi KX-3 4WD auto. Price you pay: 28,995. Drivethedeal.com will save you 1732 on the Kia Sportage 2.0 CRDi KX-2 4WD. Price you pay: 21,293. Save 2612 on the Land Rover Discovery 3.0 SDV6 GS with Coast2coastcars.co.uk. Price you pay: 35,383. Get a 2515 saving from Drivethedeal.com on the Land Rover Freelander 2.2 SD4 190 GS 4WD. Price you pay: 25,745. Save 777 on the Lexus CT200h SE-I from Coast2coastcars.co.uk. Price you pay: 22,708. Broker Coast2coastcars.co.uk will save you 3139 on the Lexus IS250 2.5 F-Sport saloon. Price you pay: 27,206. Check out Drivethedeal.com for a 2616 saving on the Mazda 3 1.6D TS2 Nav. Price you pay: 16,359. Go to Drivethedeal.com for a 3129 saving on the Mazda 6 1.8 120 TS 5dr. Price you pay: 15,726. Pay 4386 less than list price on the Mazda MX-5 2.0i Sport Tech with Drivethedeal.com. Price you pay: 18,249. Get a 2669 saving on the Mercedes E220 CDi Blue Efficiency Sport Edition 125 coupe with Orangewheels.co.uk. Price you pay: 31,456. Get a 1507 saving from Carfile.net on the Nissan Juke 1.5 dCi Tekna. Price you pay: 16,388. Carfile.net will save you 2153 on the Nissan Qashqai 1.6 117 N-Tec Idle Stop 2WD. Price you pay: 17,592. Drivethedeal.com will save you 1998 on the Peugeot 107 1.0 Urban 5dr. Price you pay: 7547. Go to Coast2coastcars.co.uk for a 2621 saving on the Peugeot 508 1.6 e-HDi 112 Access saloon. Price you pay: 16,729. Save 2650 from Coast2coastcars.co.uk on the Peugeot 3008 1.6 THP 156 Exclusive. Price you pay: 18,395. Go to Coast2coastcars.co.uk for a 3627 saving on the Peugeot 5008 1.6 HDi 112 Exclusive. Price you pay: 19,368. 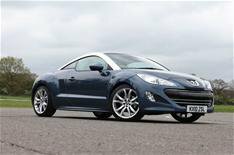 Pay 1504 less than list price on the Peugeot RCZ 1.6 THP 200 GT with Carfile.net. Price you pay: 24,441.